Neil Barrett’s soundtrack for his Fall 2018 joint menswear and womenswear show, at his Milanese headquarters, consisted of The Human League’s ‘The Things That Dreams Are Made Of’ and The Verve’s ‘Bitter Sweet Symphony.’ The 1980s and 1990s are resurgent. Big shoulders, corporate dressing, kitschy sportswear, block colours dominated the runways from January to March. Neil Barrett is a proprietor of minimalist menswear, a Central Saint Martins and Royal College of Art graduate with a background in tailoring—his father and grandfather were master tailors in Devon, the southwestern English county. His expertise brought him to Gucci where he worked as senior men’s designer, before joining Prada. Mrs. Prada’s work is often readily apparent in Barrett’s oeuvre, this season in the form of his nylon pieces. The nylon pieces were examples of reconstituted luxury, taking a fabric that doesn’t necessarily have connotations with luxury and making it that. It’s what Demna Gvasalia does, deftly, at Vetements and it’s what skyrocketed him to success: subverted luxury. Barrett’s rendition wasn’t as successful in that his clothing isn’t that exciting, it’s menswear meat and potatoes. The use of those songs this season was perhaps the most interesting part of the show because it got you thinking. Materialism, wealth, excess are significant in the context of modern luxury and similar themes are expressed in those songs. On his runway there were expensive clothing, they looked as much. 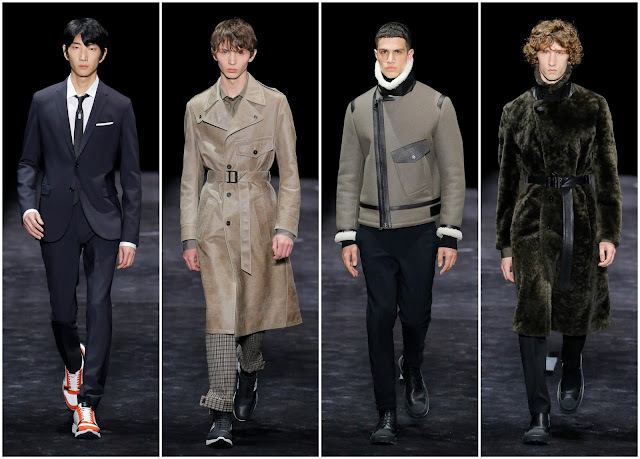 There was precision tailoring, leather detailing, shearling accents. There was a subtle richness to proceedings but the militant touches was the main message in this show. With nods to the popular theme of clothing as a means of protection—from the schizophrenic weather, political leaders or political turmoil. He rendered it in the form of militaristic workwear. Alexander Wang tried to do the same for his womenswear in New York a few weeks later. He channeled a similar dominance. Perhaps he was taking cues from Barrett, who was taking cues from Helmut Lang and Miuccia Prada. Neither succeeded in contributing something new to the dialogue—neither did Mrs. Prada at her menswear show in January—but that’s fashion nowadays. It was a give and take process. Barrett had the symbolism of his soundtrack, reflecting the materialistic 21st century society and precision tailoring, but he sorely lacked any groundbreaking addition to a preexisting narrative. It bought too much into the current preoccupation of 1990s corporate dressing, and not enough its own story, which could’ve been far more interesting had he elaborated.